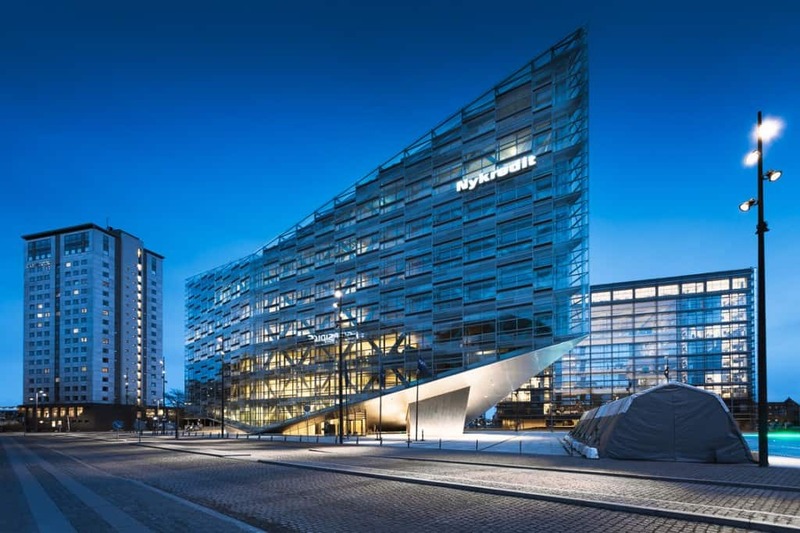 The Crystal is an extension to the head office of the Danish financial institution, Nykredit, and is located northwest of the existing premises. Freestanding on the site, it reads as a transparent, geometrical, glazed form which, resting only on a single point and a single line, floats as a light, crystalline structure above the plaza. The Crystal reflects its surroundings in terms of both form and scale, gracefully adapting to lines of sight, scales and function of the immediate context, evolving in interplay with its surroundings. It harmonies in scale with neighboring buildings, and lifts up from the plaza beneath in order to allow passage and view under the building, inviting people of the neighborhood to explore the space between the city and the harbor. The double-glazed facade reflects the daylight, and gives a homogeneous expression to the building, enhancing its sculptural form and supports the overall energy performance of the building. The large three-dimensional steel structure functions as an architectural element while at the same time allowing the building to dispense with pillars, creating maximum flexibility for the employees in the office spaces. 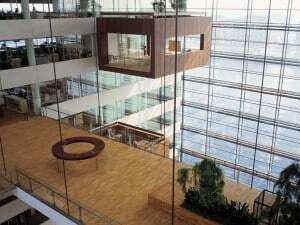 The office building Krystallen (the Crystal) designed by schmidt hammer lassen architects for the company Nykredit is a successful example of energy-conscious design. The building is a work of sleek glass geometry with a light, crystalline expression that floats over the square, anchored at a single point and in a single line. The construction is a combination of a completely transparent office building and an unusually low energy consumption of 70 kW/h per m2, and the building consequently uses 25% less energy than required by current legislation. The roof is covered by highly efficient solar cells generating 80,000 kWh per year. The building’s multi-faceted glass facade reflects both daylight and the immediate surroundings, and the double-glazed windows have built-in sun protection enabling the building to accommodate different light conditions. To this should be added that the external surface of the windows are decorated with a discrete silk print that shields against the rays of the sun while creating atmosphere both indoors and outdoors. Rain water is collected and recycled everywhere, for example in the toilets in the buildings, while sea water is used for additional cooling. The building uses a hybrid ventilation system with night cooling. Natural ventilation is channeled through the double facade and out through the two skylights in the atrium, which serves to maintain optimum indoor temperatures and a healthy physical working environment for the approximately 300 employees. The interior of the building meets the requirements of the workplace for functionality, flexibility and efficiency, as the layout of the floors provides opportunities for open plan offices, closed/private office cubicles or meeting rooms, as required. 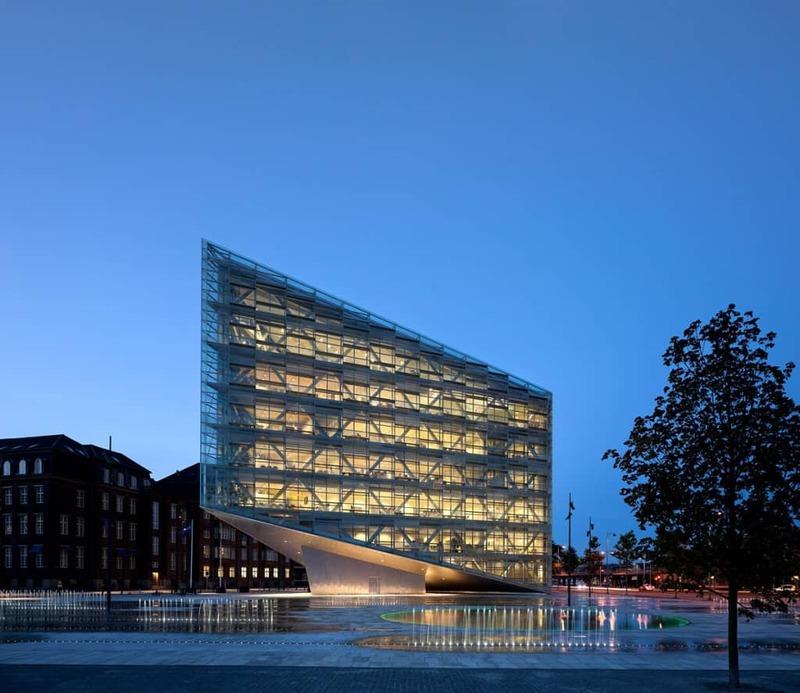 The building has been honored with a LEAF Award and an European Steel Award, and in 2012 nominated Building of the Year in the ‘Office Building’ category by one of the world’s largest architectural networks, ArchDaily.